Nancy Jordan, daughter of William Jordan and Blanche Fullerton, was born on August 15, 1808 in Kanawha County, (West) Virginia. She married Andrew Erwin in Cabell County, (West) Virginia, on June 29, 1826. Andrew and Nancy were married for almost eighteen years before his death on August 1, 1844. She never remarried, instead raising their family of eight children on their farm in Tippecanoe County. Nancy died in March 1867 in Tippecanoe County and is buried in the Hebron (Mt. Zion) Cemetery, Tippecanoe County, Indiana, where Andrew is probably also buried. Nancy is found in the censuses of 1850-TippecanoeIN and 1860-TippecanoeIN. She is possibly also in the 1820-CabellVA census in the household of William Jordan and probably in the census of 1840-TippecanoeIN in the household of Andrew Irwin. 1. Sampson Erwin was born in September 1827 in (West) Virginia, and died on April 2, 1901 in Wheatfield Township, Jasper County, Indiana. He married Rhoda Welsh, daughter of Mary Welsh, on January 22, 1850 in Jordan Township, Jasper County, Indiana. 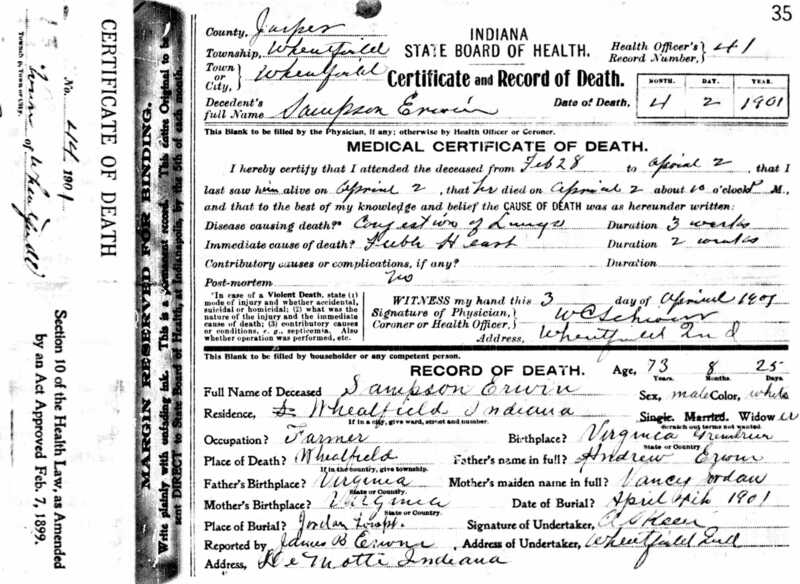 Rhoda was born on April 3, 1832 in Ohio and died on August 12, 1900 in Wheatfield Township, Jasper County, Indiana. Both Both Sampson and Rhoda are buried in Welsh Cemetery, Jasper County, Indiana. 2. Lorenzo Dow Erwin was born on October 2, 1832 in Tippecanoe County, Indiana, and died on December 13, 1916 in Newton County, Indiana. He married Mary Alice Donnally in 1859. Mary was born on April 9, 1844 in Ohio and died on July 28, 1897. Both Lorenzo and Mary are buried in Riverside Cemetery, Newton County, Indiana. 3. Mary Erwin was born in 1833 probably in Tippecanoe County, Indiana. 4. Bethany Erwin was born in November 1835 in Tippecanoe County, Indiana, and died in 1904 in Kansas. She married Philander Craig on January 21, 1854, in Tippecanoe County, Indiana. Philander was born in May 1833 in Indiana and died in 1909 in Kansas. Both Bethany and Philander are buried in Mount Hope Cemetery, Kansas City, Kansas. 5. Ellen Erwin was born in 1837 probably in Tippecanoe County, Indiana. 6. Alice Barnes Erwin was born October 9, 1839 in Tippecanoe County, Indiana, and died on August 16, 1921 in Chicago, Cook County, Illinois. She married William Campbell Robinson on March 14, 1861 in Tippecanoe County, Indiana. 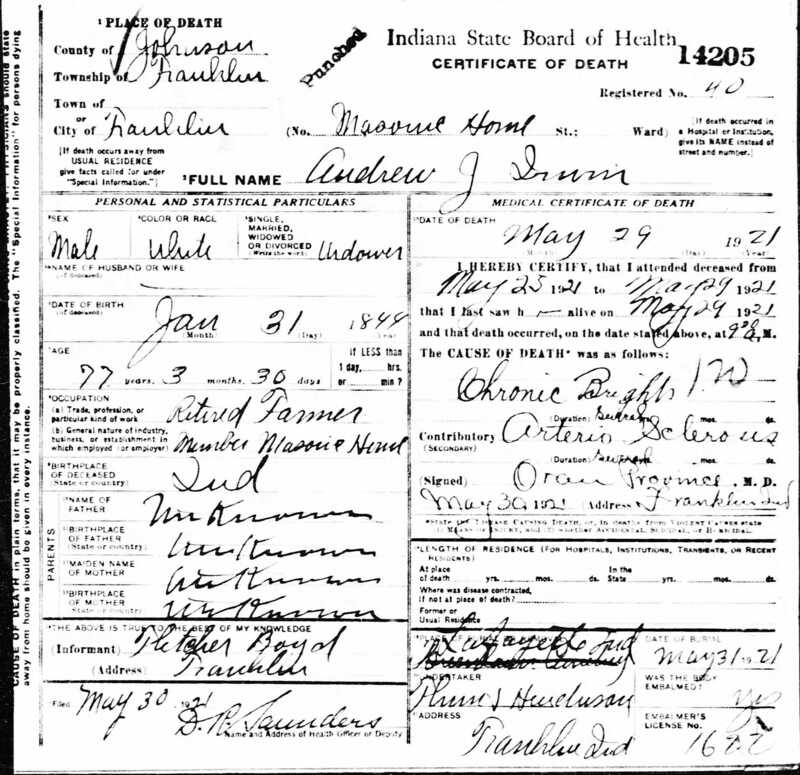 William was born in October 1833 in Indiana. 7. Virgil C. Erwin was born on November 14, 1841 in Tippecanoe County, Indiana, and died on June 27, 1927 in Jasper County, Missouri. He married Rosella Myers, daughter of William and Nancy Myers, on July 15, 1869 in Fountain County, Indiana. Rosella was born on February 17, 1846 in Indiana and died on December 21, 1941 in Jasper County, Missouri. Both Virgil and Rosella are buried in Dudenville Cemetery, Dade County, Missouri. 8. Andrew Jackson Erwin was born on January 31, 1844 in Tippecanoe County, Indiana, and died on May 29, 1921 in Johnson County, Indiana. 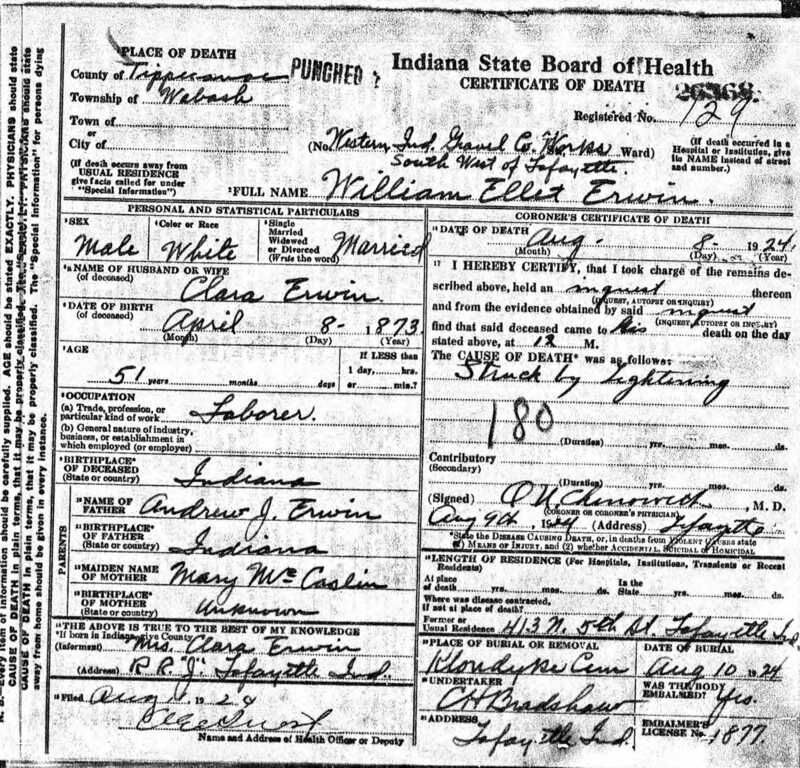 He married Mary McCaslin on June 20, 1872, in Jasper County, Indiana. Mary was born on January 19, 1852 and died on July 10, 1882. Both Andrew and Mary are buried in Hebron Cemetery, Tippecanoe County, Indiana. 1 Proof that Nancy Jordan Erwin is the daughter of William and Blanche is found in several land documents where the heirs of William Jordan are selling off their inherited land, including Tippecanoe County Land Books “W” (pp51-53) and “29” (pp612-615) both dated February 1847, and Book “29” (p108) dated April 1850. 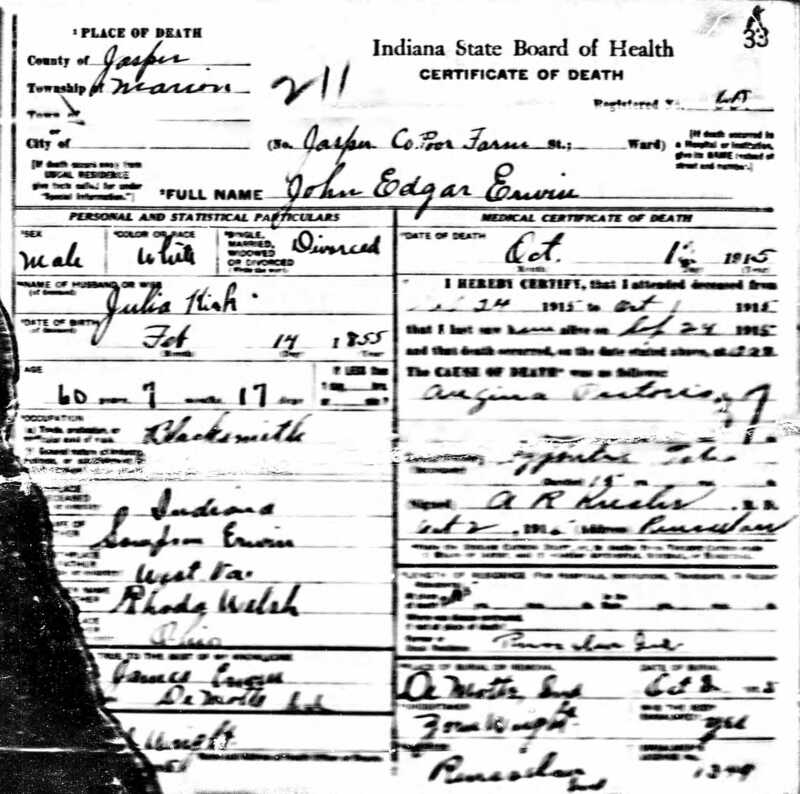 2 Sources for Nancy Jordan and Andrew Erwin and their children include Cabell County Marriage Records; 1820-1920 U.S. Censuses; Tombstones; Missouri Death Records; Missouri Death Certificates; Tippecanoe County Court Records; Indiana Death Certificates; International Genealogical Index.